Have you ever seen one of those movies where the boy or girl picks up their favorite book to read about a tale of adventure, treasure, villains and heroes....only to actually become part of the world that lives within the pages? When I was a little girl I remember being mesmerized by the movies Magic Island and The Neverending Story. So much that I would take my favorite book and spend hours reading and hoping that at some point I too would be magically swept into the stories just like Jack and Bastian were. Sadly, I quickly came to the realization that no matter how much I read, or how much I waited in front of the book, I simply wasn't going to actually be pulled into the book (womp womp). Regardless, at the time even though I was really upset Jack got to fly into books and I couldn't, I hadn't realized that I too in another sense was being "pulled" into my books. These stories fueled my imagination and the more I read, the more my mind burst with ideas and beautiful images of far away places with wonderful people and adventures. Since I know books don't really light up with magic, I decided to create my own book of magical wonders. 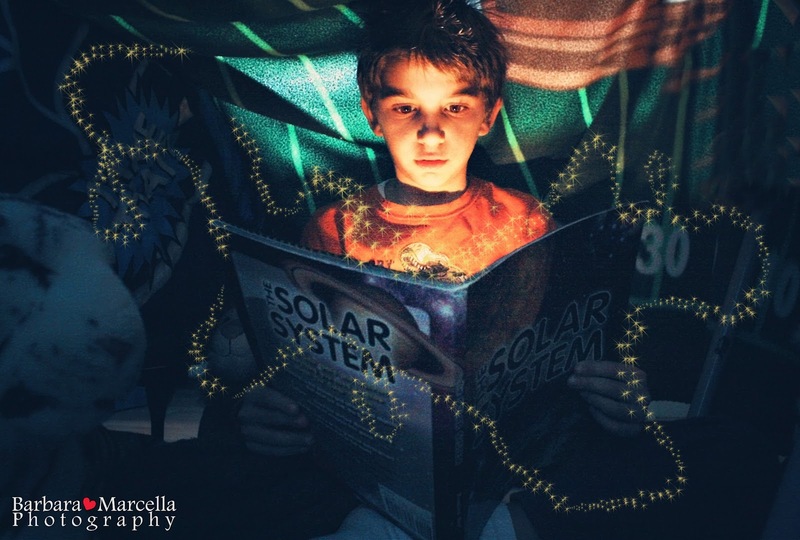 I snapped this photo of my brother reading his favorite book on the solar system, and added a few touches of magic. Who says magical adventures only await in movies? Enjoy!